The Effluent WOF programme consists of a voluntary, independent inspection of a farmer’s effluent infrastructure and practices. After extensive testing with over 200 farmers, Effluent WOF is now available to farmers and rural professionals around the country. 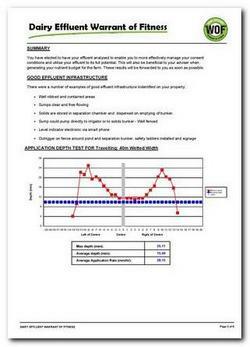 The Effluent WOF programme is insightful and practical, covering the entire effluent system. An independent assessor points out areas of risk and suggest practical actions a farmer can take to ensure their system is capable of being compliant 365 days a year. A 3-4 hour assessment by the accredited assessor covers the farm’s effluent consents and permitted rules, the storage capacity, nutrient loadings, soil risk, irrigator performance, off-pasture infrastructure and general health and safety requirements. 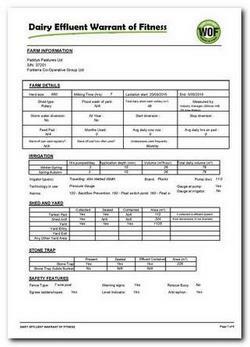 All WoF Assessors are trained professionals who are fully certified as Warrant of Fitness Assessors. 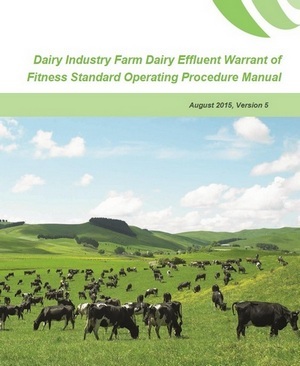 Every assessor has completed the Farm Dairy Effluent System Warrant of Fitness Course and a subsequent field assessment. 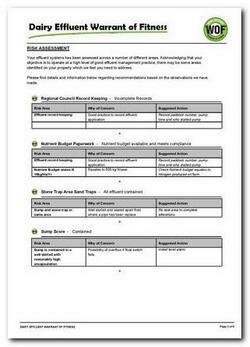 Are you a share milker coming onto a property? Upgraded the effluent system yourself? Budgeted for an upgrade to the system? "An Assessment provides a clear, independent outline of how compliant the system is today, and a roadmap of what needs to be done. It's not all negative either, the process identifies the strengths of the existing system along with areas needing improvement." 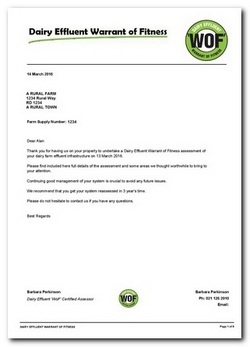 “A WOF assessment helps bring a ‘no surprises’ solution to farm purchases. Getting an assessment done means someone buying a farm won’t get caught out with an unplanned effluent upgrade bill." 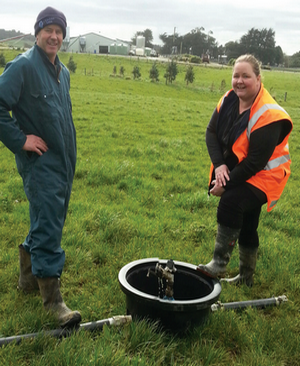 Warrants of fitness for effluent systems on dairy farms give owners confidence nutrients are being harnessed and that they’re following the best industry practice. The assessment includes the farm's effluent consents and permitted rules, storage capacity, nutrient loadings, soil risk, and health and saftey..